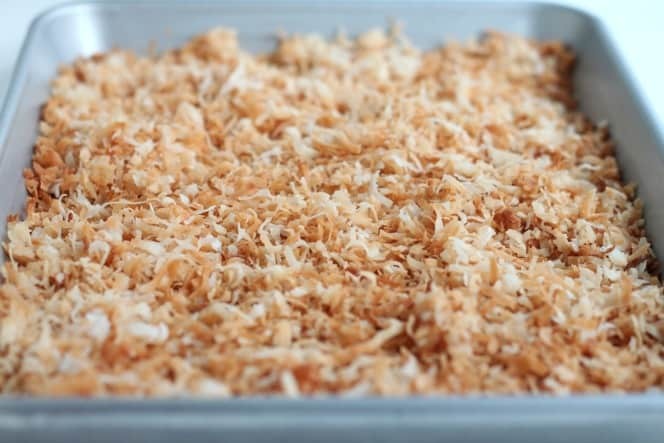 Toasted Coconut is one of my favorites, I love it on a dish of ice cream and even on my dish of yogurt for breakfast, this post will show you how easy it is to toast a whole tray of coconut in minutes to a delicious crispness. I’ve shared lots of coconut recipes like: Chocolate Coconut Football Cookies, Coconut Lime Scones, Coconut Banana Cake, Coconut Cut Out Cookies, Macaroon Chicks, Easy 3 layer German Chocolate Cake, Raspberry Coconut Scones and Grilled Cake with Pineapple and Toasted Coconut. 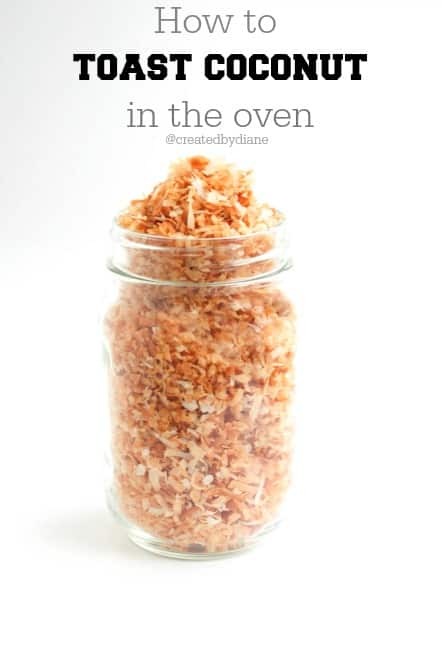 and once you have a jar full of toasted coconut I’m sure you will find many uses for it. It’s great for a fun sweet and crunchy topping. You can add it to this super easy Dessert Pizza with fresh fruit for a quick and fun treat! 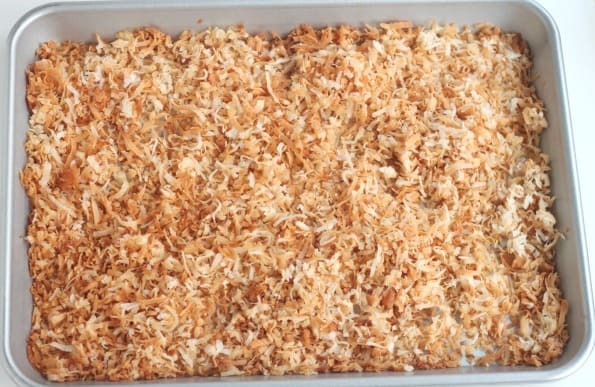 Spread out the sweetened coconut on a baking sheet. take a spatula and turn the coconut so it toasts on all sides. You don’t want it to burn. As soon as it’s all golden remove the baking sheet from the oven. 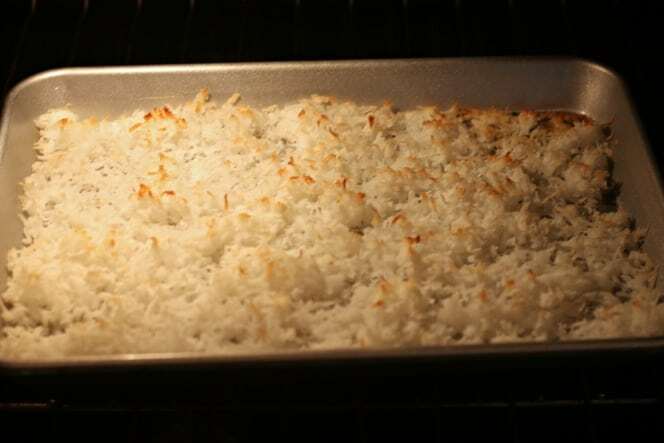 Spread the coconut into a thin layer on a ¼ baking sheet. Place in upper portion of the oven. Turn the coconut so it toasts evenly with a spatula/turner. 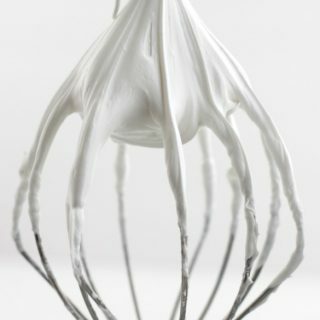 Bake 8-10 minutes or until coconut is golden. 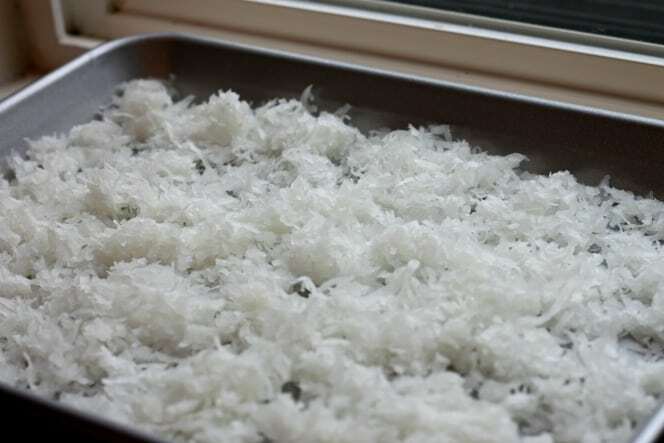 Allow toasted coconut to completely cool, then store in an airtight container. Will keep fresh for one month at room temperature. 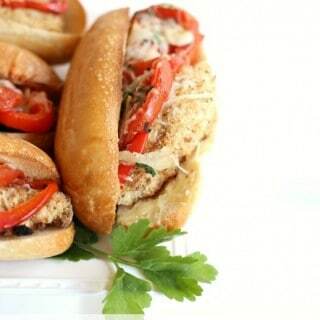 What will you put toasted coconut on? I could eat that entire pan! I adore toasted coconut! 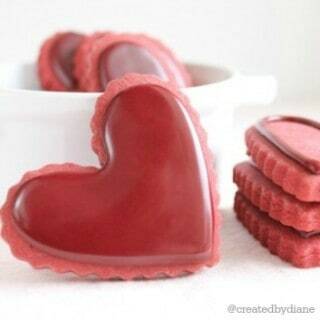 It is my favorite! Your whole pan turned out so perfectly evenly toasted! I love it! Nothing quite like the smell of freshly toasted coconut!! Wow, that IS easy! This would be great to have on hand for yogurt and cereals. 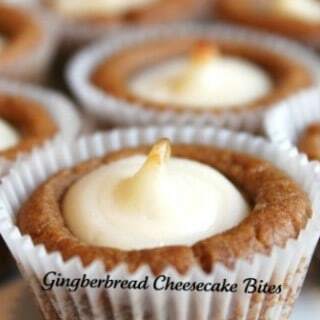 So going to make! I’m the worst at ‘watching closely’ I always usually burn the first batch – whether it be coconut, sliced almonds, pecans.. whatever! Haha! This is so easy! I never thought this way. Thanks for the tips, I just made this!